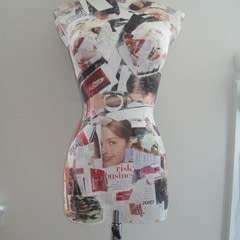 A dress form made personally for you! Do this with a partner! Do not do it alone. Keep telling yourself that you can breathe! 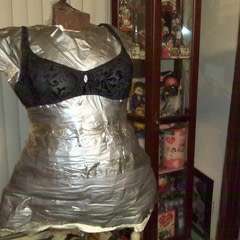 I ended up using two rolls of duct tape and 3 bags of polyfill for the entire mannequin. I'm 5'3" and have a short waist, so guestimate based on your height and weight. Having a body double of yourself comes in handy for making clothes that truly fit you. 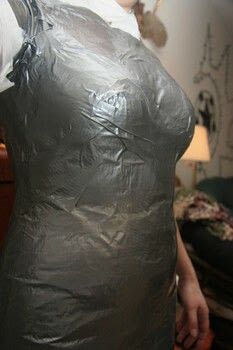 It's important to keep an appropriate posture during the initial taping, otherwise your form will come out slouched or will be positioned incorrectly and your clothes will be incorrectly fitted. I kept wanting to raise my shoulders because I was feeling claustrophobic. Shoulders down, back straight, tail bone tucked under. 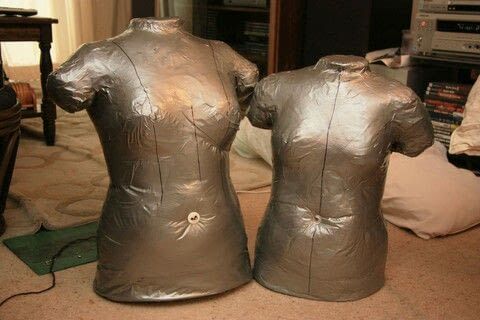 These are my best suggestions to obtaining the right posture for your mannequin. Before you cut off the mannequin, have your partner mark your waist line as demonstrated in the photo. This is your rib line (your true waist line), not your hipster line. 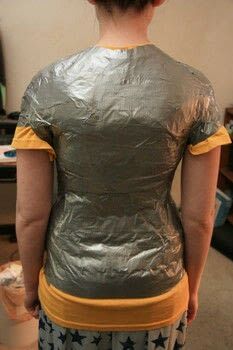 Once you have 3-4 layers of tape, have your partner cut straight (or as straight as possible) along your spine to remove the form. 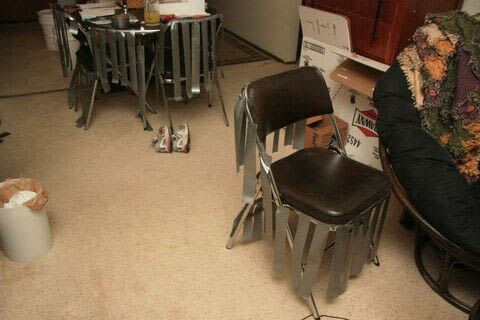 Then use 3-4 inch pieces of tape to close off the cut. The wire needs to be a strong, heavy-duty wire from Home Depot or Lowes. It is going to keep your waist depth constant, so make sure it's not jewelry wire. Use a large two-holed button. Once the mannequin is removed from your body, mark your center front and center back with sharpie. Have your partner measure your waist depth, I started at my belly button and ended at my dimples of venus. 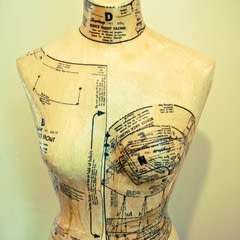 Place one button over your mannequin's belly button and puncture through the holes one at a time. 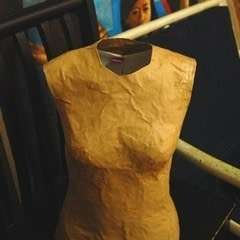 Place the other button in the same position on the back of the mannequin and puncture through the holes from the inside. You will now want to pull in the waist of the mannequin until your waist depth has been reached. Secure the button on the back by twisting the wire. Try to tuck the cut ends of the wire back into the button holes so you don't scratch yourself to death like I did. Stuff the arms with polyfill and then the body, making sure to STUFF it, don't let any pockets appear where you can poke in the tape. 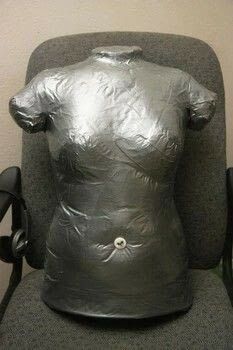 One it is properly stuffed,place the mannequin upright on top of a piece of cardboard and trace around the base with a sharpie. Cut out the oval and use it as a guide to make one more oval. Carefully insert the ovals one at a time into the base of the mannequin so that It can sit upright without flopping over. Once secured, duct tape over the bottom. 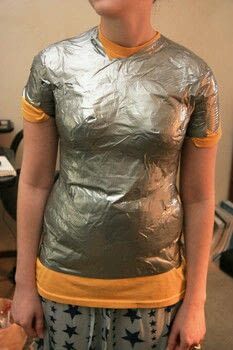 I did the same for the neck hole. I made two small circles and taped them into the neck so that it was rigid. Lastly, mark whatever lines you need onto the body. I did princess seams and CF and CB seams. Pins are difficult to push through sometimes. 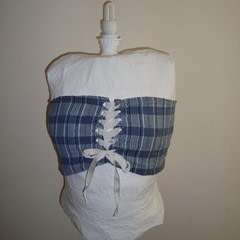 My fingers were really red by the time I'd fitted a test run bodice. Pins get sticky with duct tape residue. So. Irritating. Ideas for edit: Cover the form with cheap fabric so that you pin to the fabric instead of the duct tape.